Hi everyone, I'm using the "frontpage slide show" module to display some items on my frontpage. In the settings for the module I've set the "Menu Item Links" to "mainmenu | Home" which is my frontpage. Now this works as expected on the front page, however when I view the main body of some of my content items the "frontpage slide show" module appears on those pages too! None of these content items are linked in any menus so I definitely haven't accidentally left those pages selected in the "Menu Item Links" for the module. So can somebody tell me where is the problem? Re: Set Module to frontpage only but appearing on other page? I have this problem also when you click on any thing from the front page on my site. If I try to edit a content item from the front page it overlaps the front page only modules, if I click a cb profile from the front page module it loads it on the front page, and if you click on a video from the front page module it overlaps the video over the front page only modules. I have a hunch it is pulling these things as a front page item (item=1). Does anyone know of a way to get around this and to have these things pull as a non front page item? This is happening to me too, does anybody have a solution please please please, i have a slideshow that is only assigned to "home" in my main menu and no other menu items and in no other menus, yet it appears on every single page on my site, i really need to sort this out as the slideshow is big and i don't want people to have to scroll down past it on every page before the get to the content they are trying to navigate to. Will PM my site address to anyone that wants to help. This seems like the problem with Itemid not handled correctly. Go to JoomSEF configuration, Advanced page, and check that "Exclude source info (Itemid)" and "Reappend source (Itemid)" are both set to No or both to Yes. You can also try setting the "Ignore multiple sources (Itemids)" option to No. Don't forget to delete the already created URLs and clear the JoomSEF's cache after the changes in configuration. I don't have JoomSEF, how would I solve the problem? with sh404SEF? 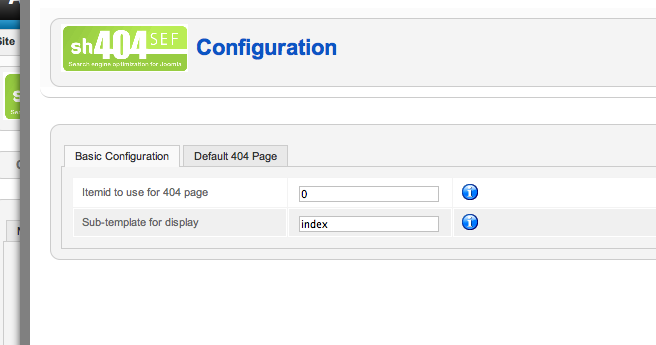 With sh404SEF the item id configuration is on the Advanced Tab under "Item id Management". Setting "Insert menu Itemid if none" to NO fixed this for me. For the record I have all the options under Item id Management set to NO. Last edited by toivo on Tue Feb 20, 2018 7:55 pm, edited 1 time in total. Im having this exact same problem. On the front page, other modules that have links are appending the frontpage itemid to their links. So any item that should appear only on the front page also appear when clicking on those module links. I do not have Joomsef or sh404sef installed. How do I fix this without sef urls? Once I emptied the URL Cache this fixed my issue. Hope this helps someone out there cause I was looking for a solution for hours!!! This is due to Joomla limitation. When some articles/categories dont have menu (read item id) they go under frontpage itemid. Disable sef url from Global Config and you'll see the problematic article is using frontpage itemid (menu id). As Module is assigned to that item id, that module appears in those articles. Make a new menu. Choose either "Category Blog" or "Category List" in your Menu Item Type. Then, choose the category you used in the slideshow. That's all. I am using Joomla2.5 and Sh404sef. The problem was solved after I purged all of sef url in sh404 and cleaned cache. revamper wrote: This is due to Joomla limitation. The revamper explanation is the solution. I have Joomla 2.5 without any SEF component. Under "Error page configuration" there is a item ID setting which was set to 0 and it needs to have a bigger number (see picture).